If you know me, you know I'm one of those Christmas-crazed people. I try to keep it on the down-low for the most part. Some folks seem to find it offensive that I think about the holidays in June. Sure, I privately listen to Christmas music starting in September. Listen. It used to start in August. I've come a long way. There are some serious benefits to thinking about the holidays during the dog days of summer. Planning ahead brings so much peace. It also really helps the grocery budget stretch and keeps healthy food on the dinner table instead of bags of take-out during the craziest of seasons. Here's my plan: starting now, I will be freezing one meal each week until December. Then there will be fourteen meals in my freezer, ready to pull out at a moment's notice. The idea is to make a double batch of the meal I'm freezing and serve one the day I make it and freeze the other for December (or Thanksgiving week). Want to see what I'll be freezing? Visit Modern Alternative Kitchen to find my list: Freezing Ahead for a Peaceful Holiday Season. What do ya say? Wanna fill our freezers together? I too start thinking about Christmas in the summer! Glad I'm not the only one. ;) And thanks for the great meal ideas! I also just found out that I'm pregnant with number five so I may up the anti to two meals a week to get a jump start before morning sickness starts. 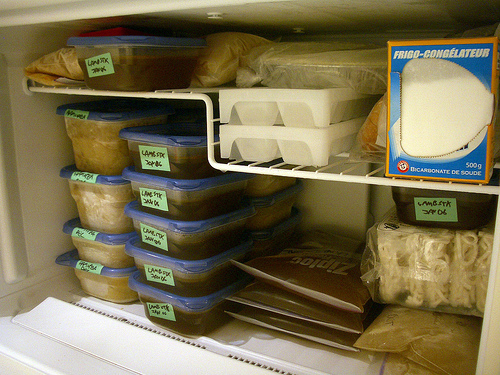 I like the idea of freezing one meal each week, simple a double batch of what is already planned. I LOVE the concept of freezer cooking, but setting aside several hours just seems too daunting with all the other responsibilities we have.